A sidekick (Bill Pullman) gets kicked upstairs in The Ballad of Lefty Brown. Jared Moshe, the writer and director of The Ballad of Lefty Brown, is a fan of classic Westerns and he's made a movie that should please fellow aficionados. He offers one twist on the formula, but the plot, setting, and widescreen images are all as standard-issue as a Colt 45. Like The Hero and Lucky -- recent showcases for Sam Elliott and Harry Dean Stanton, respectively — Moshe's film is built around a veteran performer. Bill Pullman takes the role of a man who's thrust, uncomfortably, into the center of events. Just as Pullman usually plays supporting parts, Lefty Brown is by nature a sidekick. Aside from his assertive mutton chops, Lefty is hardly a commanding figure. He walks with a limp, and talks about as gracefully as he moves. He's not conspicuously intelligent or educated. Asked to read something, Lefty makes excuses about how his eyesight's not so good anymore. Where the Elliot and Stanton vehicles both offered a contemporary vantage on the dying myth of the West, Lefty Brown is set in 1889. Yet it, too, observes the encroachment of a less freewheeling era. 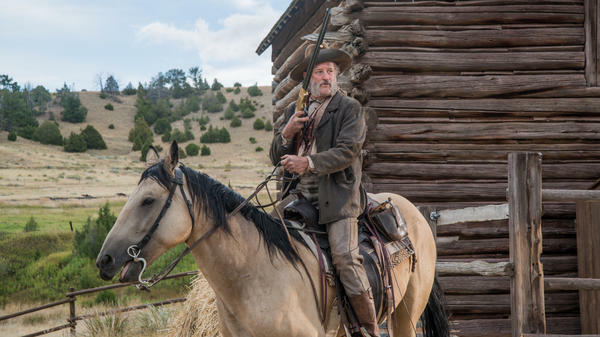 Technology, in the form of the railroads, threatens the independent spirit of men like Eddie Johnson (Peter Fonda), a successful rancher who's just been elected to represent the new state of Montana in the U.S. Senate. While Eddie is about to become a lawmaker, he's not one for legal niceties. The movie's jump-start prologue is a shootout on a dark and stormy night, which Eddie follows with an extra-judicial hanging. Soon after, a misadventure involving some horse rustlers leaves Eddie dead, and Lefty a sidekick no longer. Laura (Kathy Baker), Eddie's widow, is tougher than Lefty, as she demonstrates in how she deals with men, horses, and the occasional rattlesnake. She doesn't think Lefty can handle a ranch or dispense vengeance. Laura is pleased when two old friends arrive. Jimmy (Jim Caviezel), the state's new governor, wants to leave the murder investigation to the authorities. But Tom (Tommy Flanagan), a Scottish-accented U.S. marshal and recovering alcoholic, eventually agrees to help Lefty pursue Eddie's killers. On their quest, the men meet Jeremiah (Diego Josef), an adolescent with dreams of becoming a legend of the West like the ones he reads about in pulp fiction. He's starstruck when he realizes that Eddie and Tom — but not Lefty — are two of the heroes he's been following. The stories are heavily fictionalized, Jeremiah learns, but he still believes in them. It turns out that Eddie's death was not, of course, a random crime. All that's left is to determine the betrayer, and for three men to prove themselves better than their weaknesses. Jeremiah needs to grow up. Tom must put down the bottle (again). And Lefty has to show he can figure things out and fix them just the way Eddie did. Shot on film in the state where it's set, The Ballad of Lefty Brown is old-fashioned in both appearance and outlook. Moshe is not interested in anything newfangled, whether quick-cut action scenes or revisionist American history. When it's all over, Lefty rides off as if he's really one of the gunslingers whose exploits drew Jeremiah to Montana. There are narrative reasons for his departure, but the thematic one is more important: Lefty may not be a great hero, but he's too good for the place Moshe clearly sees as a paradise lost.